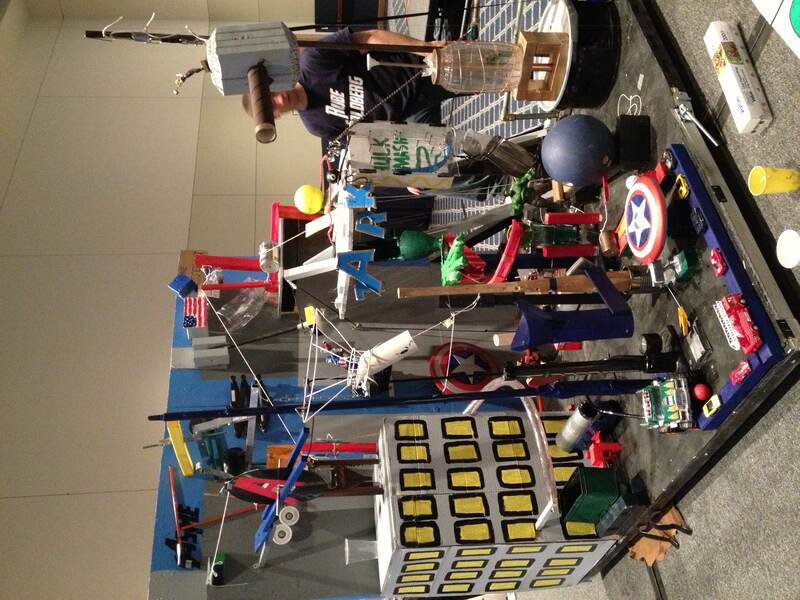 Home » Posts Tagged "Rube Goldberg"
The American Society of Mechanical Engineers (ASME), University Park chapter, won the Penn State Regional Rube Goldberg Machine Contest for the fifth year in a row on Saturday afternoon at the Penn Stater Conference Center Hotel. In addition to winning a trophy and cash prize, ASME University Park earned the chance to represent Penn State at the national competition on March 30 in Columbus, Ohio. Teams representing four other Penn State student organizations also competed in the contest: ASME, Harrisburg chapter; the Chinese Undergraduate Student Association (CUSA); the Institute of Electrical and Electronic Engineers (IEEE), and the Engineering Leadership Society (ELS). All teams were challenged to use innovative ideas, unconventional problem-solving skills and a little humor to design and build a machine that hammered a nail in 20 or more steps. 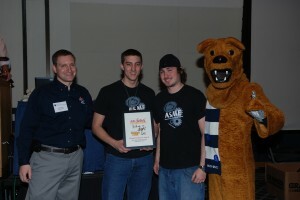 ASME Harrisburg placed second in the overall contest, followed by ELS in third place. 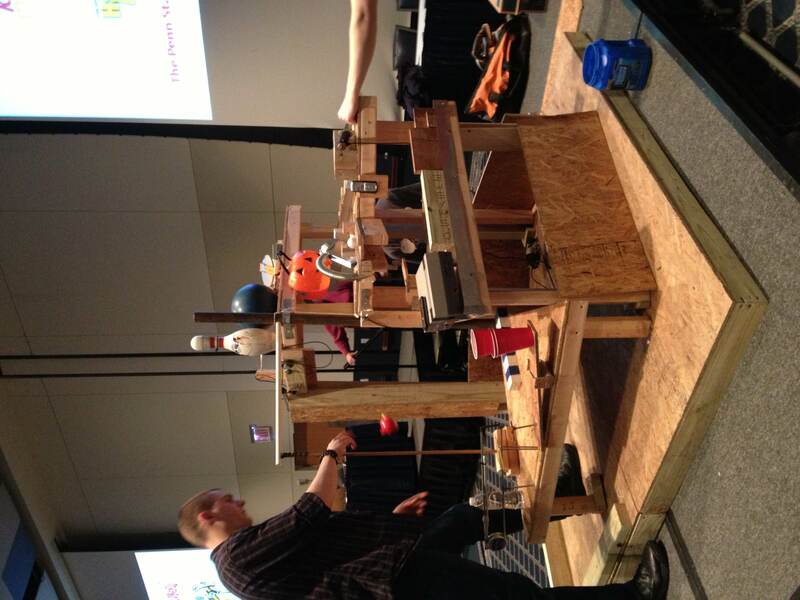 The People’s Choice Award went to ASME Harrisburg’s machine, which featured favorite toys from childhood including old video gaming systems, a bowling ball and guitars. Teams were judged on two runs of their machine and had the option of voiding one of their first two runs in favor of a third, provided the void was called before the task was completed. 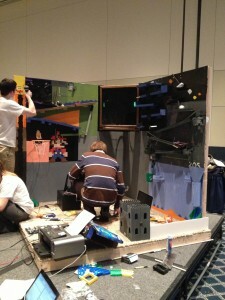 All five teams used the time between rounds to make adjustments or repairs to their machines. Between the rounds, four Engineering Ambassadors, an engineering student organization focused on community outreach, gave presentations about simple machines and the magic of engineering while the competitors reset their machines for the next round. 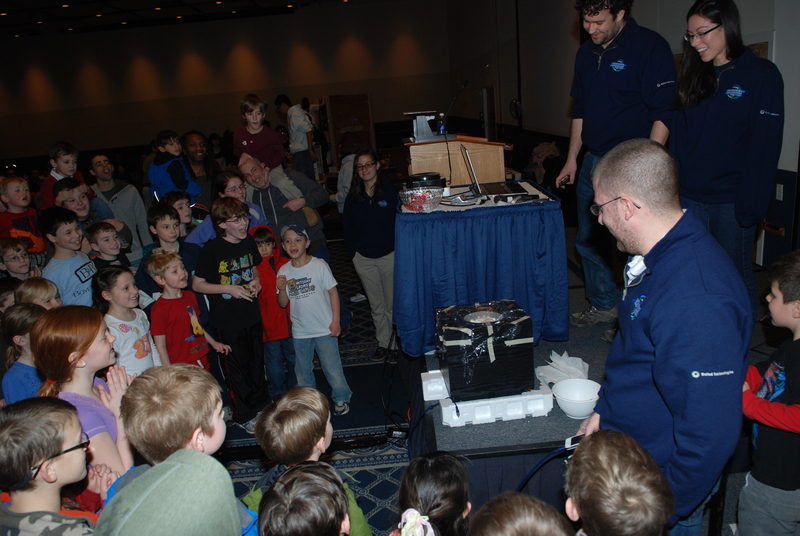 Kids were invited up to the stage to view one of the presentations, which combined a speaker and Non-Newtonian Fluid, also known as Oobleck. Engineering Ambassadors entertain the audience during intermissions. All five teams used the intermissions to make adjustments or repairs to their machines. 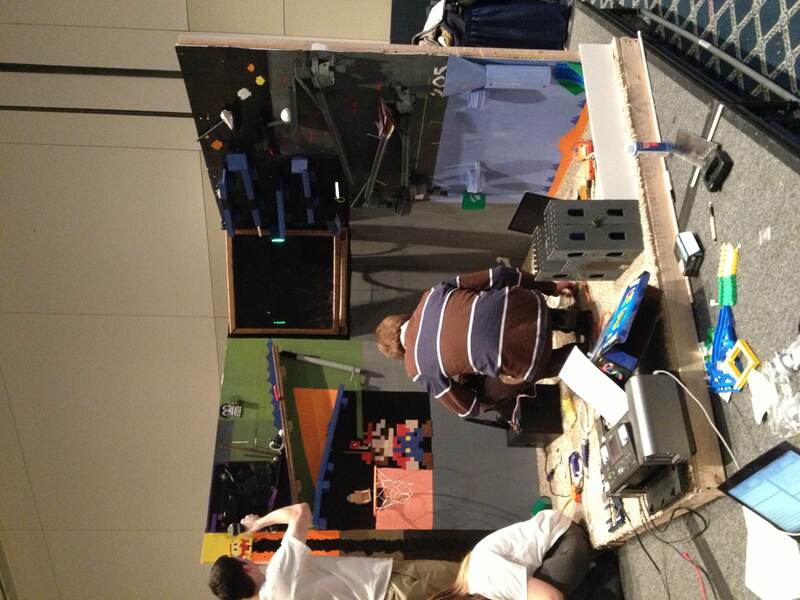 Throughout the months leading up to the event, teams put countless amounts of hours into building their machines. CUSA team captain, Xiaomo Zhang, a junior in aerospace engineering, says that him and his team dedicated more than 100 hours to the entire process. “This is a really meaningful activity and it is good to interact with the community, gain leadership experience and create machine designs,” he explained. ELS team captain, Yolainne Moran, who agreed, adding that she really enjoyed the entire process of the contest and bringing in new ideas from the freshman members of the organization. 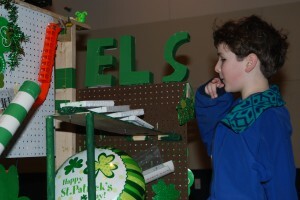 ELS featured a machine with the “Luck of the Irish” theme. ASME University Park came up with their idea for their machine after throwing around several ideas between team members said team captain Alec Tanida, a senior in mechanical engineering. “We knew that an Avengers theme would be good because it is relevant and would get the attention of kids with Captain America and the Hulk,” he recalled. ­­­­­­Tanida competed in the 2011 and 2012 national competitions as a member of the 2011 and 2012 ASME University Park teams and said that it really helped him and some of his teammates prepare for the regional competition and calm under pressure. 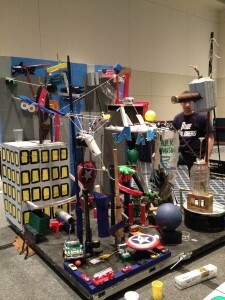 The entire team will head to the national Rube Goldberg Machine Contest in Columbus, OH at the end of March. 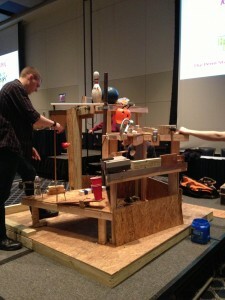 ASME placed second and third at the 2011 and 2012 national competition, respectively. The contest is named after Pulitzer Prize winning cartoonist, Reuben Lucius Goldberg, who drew cartoons that combined simple machine parts and household items to create contraptions that accomplished simple tasks in a laughable number of excess steps. Although he never built any of his machines, Goldberg’s creative thought process and innovation have become an inspiration to engineers and scientists all over the world. 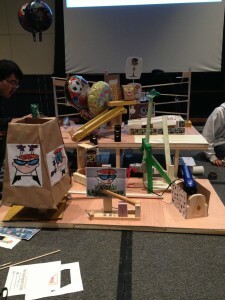 More information about the event is available at: www.engr.psu.edu/RubeGoldberg. 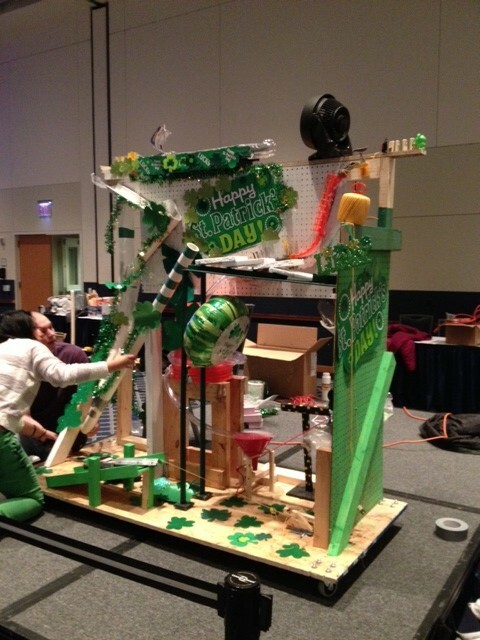 Teams representing engineering student groups will compete in the 2013 Penn State Regional Rube Goldberg Machine Contest at 1:30 p.m. on Feb. 23 in Presidents Hall at the Penn Stater Hotel and Conference Center. Sponsored and judged by the Penn State Engineering Alumni Society, the contest is free and open to the public. 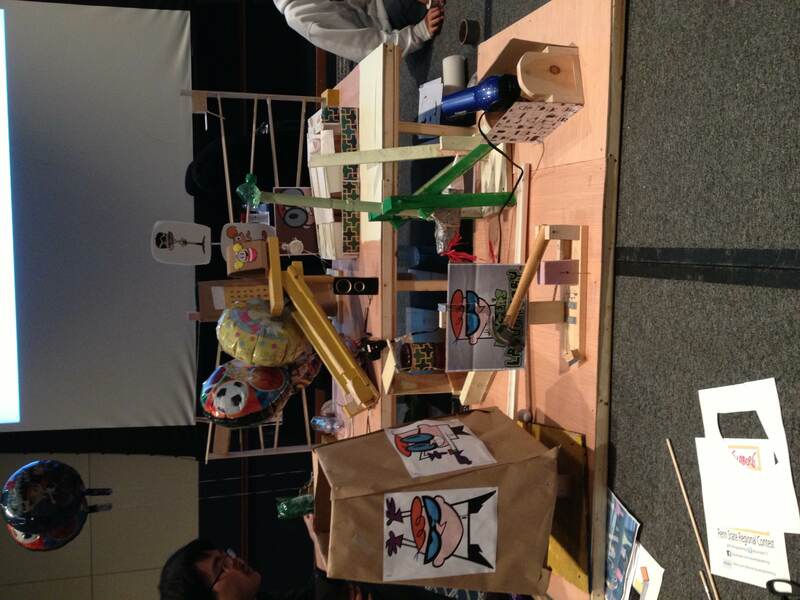 Doors will open at 1:00 p.m.
Held annually, the Rube Goldberg Machine Contest challenges students to use innovative ideas, unconventional problem-solving skills and a little humor to design a machine that accomplishes an otherwise trivial task. 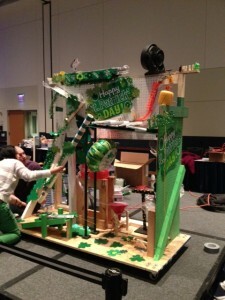 This year’s national challenge is to design and build a machine that hammers a nail in 20 or more steps. You can learn more about the contest on our Contest Details page. 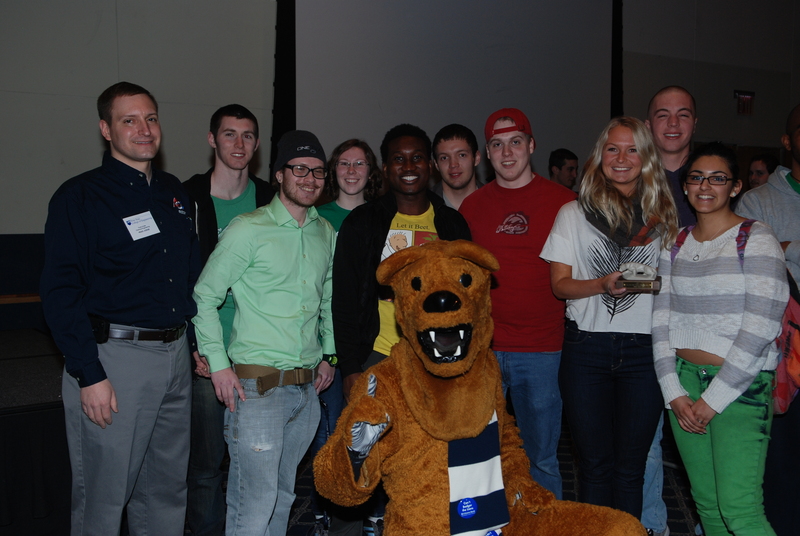 Teams entering the 2013 Penn State contest include the American Society of Mechanical Engineers (ASME) of both University Park and Harrisburg, the Institute of Electrical and Electronic Engineers, the Chinese Undergraduate Student Association, the Society of Engineering Science, and the Engineering Leadership Society. ASME will be defending its four-year winning streak at the Penn State regional competition. 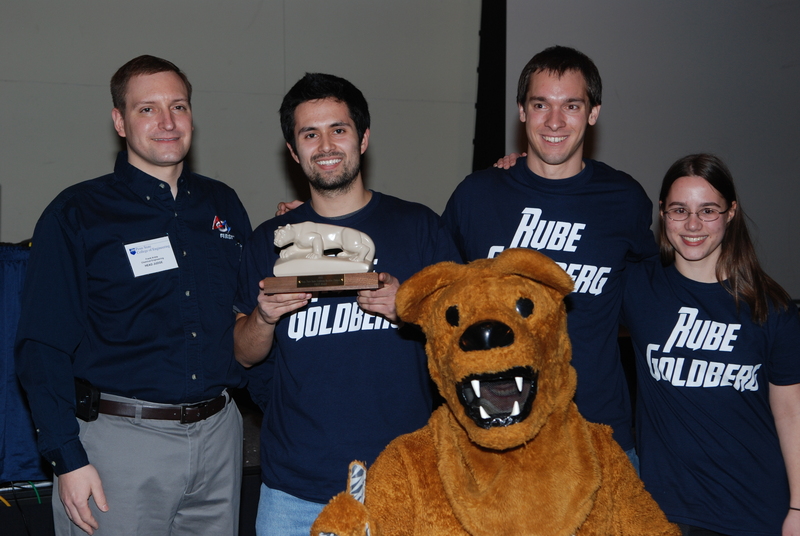 The top three teams will win trophies and cash prizes, and the winning team will be eligible to represent Penn State at the National Rube Goldberg Machine Contest on March 30 at the Center of Industry and Science in Columbus, OH.